ww2dbaseHisaichi Terauchi was born to Army officer Masatake Terauchi in 1879. In 1900, he graduated from the Japanese Army Academy and then saw action during the 1904-1905 Russo-Japanese War. In 1909, he graduated from the Army Staff College. In 1911, his father was made a Count (hakushaku), thus raising his family to nobility status. In 1916, his father was made the Prime Minister of Japan. Around this time, he served as a military attaché in Germany and as an instructor at the Army Academy. In Nov 1919, his father passed away, and he assumed his father's title of Count. In the same month, he was promoted to the rank of colonel. In 1924, he was promoted to the rank of major general. In 1927, he was made the Chief of Staff of the Japanese Chosen Army in Korea. In 1929, he was promoted to the rank of lieutenant general, and shortly after was made the commanding officer of 5th Division. In 1932, he was made the commanding officer of 4th Division. Between Aug 1934 and Dec 1935, he was the commanding officer of the Japanese Taiwan Army. In Oct 1935, he was promoted to the rank of general. Between Mar 1936 and Feb 1937, he served as the Army Minister. 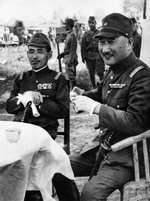 ww2dbaseIn Aug 1937, shortly after the outbreak of WW2 in Asia, Terauchi was made the commanding officer of the Japanese North China Area Army. In 1938, he was awarded Order of the Rising Sun 1st Class. In Dec 1938, he stepped down as the commander of the North China Area Army. In Nov 1941, he was named the commanding officer of the newly formed Southern Expeditionary Army Group, which was tasked with the invasion and occupation of European colonies in Southeast Asia and in the Pacific. In 1942, he moved his headquarters to the recently conquered Singapore. 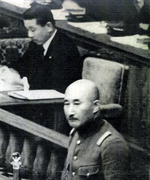 In Jun 1943, he was promoted to the rank of Field Marshal (Gensui). In May 1944, he moved his headquarters to the Philippines. As the Allies approached, he again moved his headquarters, this time to Saigon, French Indochina. In May 1945, he suffered a stroke. ww2dbaseAfter the war, Hisaichi Terauchi surrendered to British Admiral Lord Louis Mountbatten in Saigon in Nov 1945. While in captivity in a prisoner of war camp in British Malaya, he passed away from a stroke in 1946. He was buried at the Japanese Cemetery Park in Hougang, Singapore. ww2dbaseThe sword Terauchi surrendered to Mountbatten, made in 1413, is now kept at Windsor Castle in Windsor, Berkshire, England, United Kingdom. 8 Aug 1879 Hisaichi Terauchi was born in Yamaguchi Prefecture, Japan. 26 Aug 1927 Hisaichi Terauchi was named the chief of staff of the Japanese Chosen Army in occupied Korea. 1 Aug 1934 Hisaichi Terauchi was named the commanding officer of the Taiwan Army. 6 Nov 1941 Hisaichi Terauchi was named the commanding officer of the newly formed Southern Expeditionary Army Group. 6 Jun 1943 Hisaichi Terauchi was promoted to the rank of Field Marshal. 10 May 1945 Hisaichi Terauchi suffered a stroke while in Saigon, French Indochina. 9 Aug 1945 Sukarno, Mohammad Hatta, and Radjiman Wediodiningrat flew to Saigon, Cochinchina, French Indochina to meet with Field Marshal Terauchi Hisaichi. Sukarno was made the head of the Indonesian independence committee. 29 Oct 1945 Major violence broke out in Makassar, Indonesia between nationalists elements and Dutch colonial forces. 30 Nov 1945 Field Marshal Hisaichi Terauchi formally surrendered to Admiral Louis Mountbatten in Saigon, Cochinchina, French Indochina. 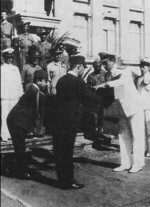 Terauchi agreed that his troops would continue to maintain order in French Indochina. A number of Japanese officers and men, fearing their fate, would slowly desert starting from this date, with some joining and fighting alongside of Viet Minh and Pathet Lao. 12 Jun 1946 Hisaichi Terauchi passed away from a stroke in a prisoner of war camp in British Malaya.